William Shakespeare said, "All that glitters is not gold". But take it from me, all that glitter does not necessarily have to be gold if it is stylish! Stylish and chic is exactly what one of India's finest fashion jewellery brands; Juvalia & You has to offer. Trendy pair of earrings, necklace, rings, hair accessories, anklet and bracelet that have been designed keeping the latest trends as well as classic styles in mind to create unique one of a kind jewellery pieces for the modern day woman. Fashionopolis is happy to be associated with and announce that one of Indian finest jewellery brands Juvalia & You offers an exclusive FACEBOOK GIVEAWAY for friends and readers of Fashionopolis. Let me tell you this is no ordinary giveaway, cause there will be not just 1 or 2 winner but 4 lucky people stand a chance to win exclusive Rs.500/- voucher from Juvalia & You. 3. Share this Giveaway picture and tag 5 friends. 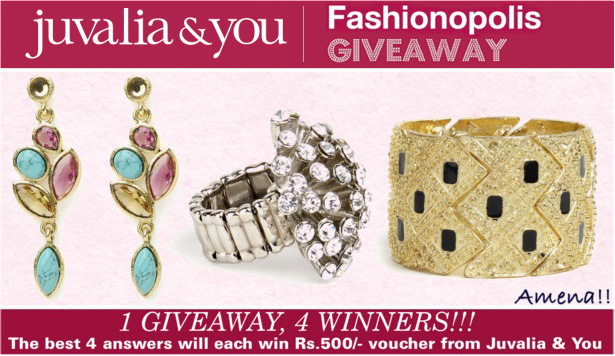 The best 4 answers each will win an exclusive Rs.500/- voucher from Juvalia & You. Giveaway ends on 24nd March 2013. ENTER NOW!!!!! You got a great blog!! Loved it!! I must have Juvalia & You jewellery because they have an awesome range of exquisite fashion jewelleries that are unique, stylish and trendy. They not only make us look beautiful and elegant but also have an excellent work of art. Every product in the collection is handpicked keeping in mind the ever-changing taste of modern women. They produce irresistible and trendy jewellery scoured by style scouts from Brazil, France, Russia and Germany. Juvalia & You jewellery are masterpieces of charm, elegance and creativity and a must-have for a modern woman who wants to stand out of the crowd in her fashion sense. Also tweeting about this @Phantom_Delight. THANK YOU to everyone who participated. Stay tuned more Giveaways coming soon your way.